I don't write on the forensics side of security much, but I thought this was an interesting topic that I'd not seen covered much before. While I was doing my research on USB hardware key loggers I learned quite a bit about USB devices that I did not know before. Besides Vendor IDs and Product IDs, some devices also have a serial number associated with them. Ω A USB flash drive is found with contraband on it, but none of the suspects claim to own it. 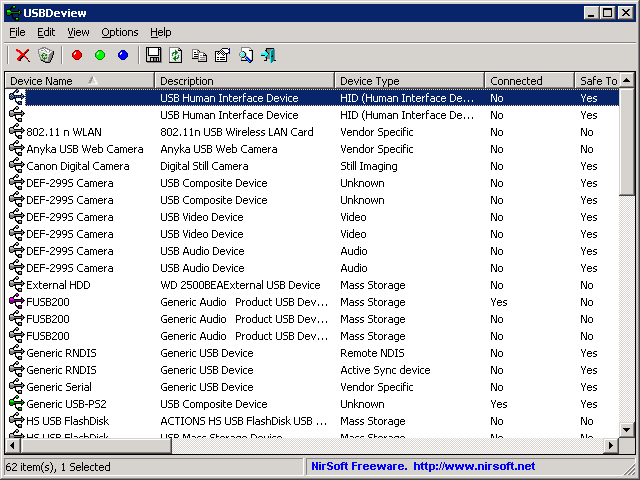 If the serial number of the USB flash drive is found in one of suspects' Windows registry this is possible evidence as to who it belongs to. Ω Malware has been spreading though your network, and you think thumb drives are the vector. Using the serial number you could search the network for computers where a known infected drive was used to give you an idea as to which workstations you will have to do clean up on. It may also lead you to know who brought the malware into the network (Patient Zero), or who been the biggest Typhoid Mary. Ω You suspect some data has been stolen from a department server, and you found a suspicious MP3 player’s serial number in the Windows server's registry. MP3 players can be used as generic storage devices. By searching the network for other boxes where that same MP3 player has been plugged-in you may find that the only other box it's ever been use on is Bob's. This makes Bob a likely suspect. USBDeView gives the user a ton of information about what devices are currently plugged-in, and what ones have been plugged-in before but are not currently present. This sort of information can be erased, but local attackers rarely think of the tracks that their USB devices leave behind. I cover erasing USB track in more detail in the anti-forensics video which I will link to at the end of this article. With a little automation you could make regular reports. I'm still interested in finding better ways to track this sort of information, so if you know of any good free or open source asset management systems that log USB serial numbers, or are interested in coding something to help automate these types of searches, please let me know. it's about three hours and seven minutes long, but covers a lot more than just USB devices. I hope you have enjoyed the article, and feel free to follow me on Twitter @Irongeek_ADC .